a yellow to orange bile pigment produced by the breakdown of heme and reduction of biliverdin; it normally circulates in plasma and is taken up by liver cells and conjugated to form bilirubin diglucuronide, the water-soluble pigment excreted in the bile. Bilirubin. The metabolism of bilirubin. Once bile is taken up and conjugated by the liver, some leakage of bilirubin mono- and diglucuronides does occur, but these normally account for less than 5% of circulating bilirubin. In bile, more than 80% is conjugated as the diglucuronide form. From Aspinall and Taylor-Robinson, 2001. Failure of the liver cells to excrete bile, or obstruction of the bile ducts, can cause an increased amount of bilirubin in the body fluids and lead to obstructive jaundice. Another type of jaundice, hemolytic jaundice, results from excessive destruction of erythrocytes. The more rapid the erythrocyte destruction and hemoglobin degradation, the greater the amount of bilirubin in body fluids. Laboratory tests for the determination of bilirubin content in the blood are of value in diagnosing liver dysfunction and in evaluating hemolytic anemias. (See accompanying table.) 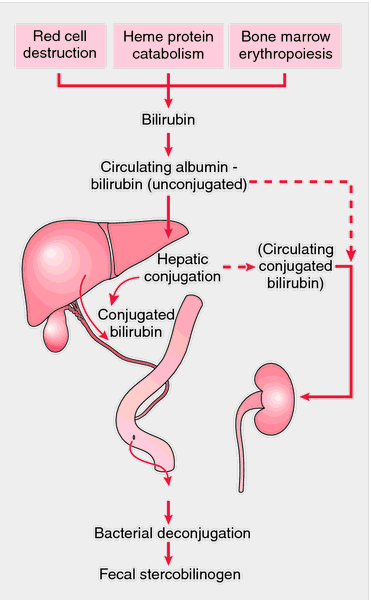 Bilirubin may be classified as indirect (“free” or unconjugated) while en route to the liver from its site of formation by reticuloendothelial cells, and direct (bilirubin diglucuronide) after its conjugation in the liver with glucuronic acid. Elevated indirect bilirubin levels indicate prehepatic jaundice, such as hemolytic jaundice, or certain types of hepatic jaundice involving inability to conjugate bilirubin. Elevated direct bilirubin levels indicate other types of hepatic jaundice, such as in viral or alcoholic hepatitis, or posthepatic jaundice, as in biliary obstruction. Normally the body produces a total of about 260 mg of bilirubin per day. Almost 99 per cent of this is excreted in the feces; the remaining 1 per cent is excreted in the urine as urobilinogen. A pigment derived from hemoglobin that contains no iron but is closely related to or identical to bilirubin. Hematoidin is formed intracellularly, presumably within reticuloendothelial cells, but is often found extracellularly after 5-7 days in foci of previous hemorrhage. It occurs as refractile, yellow-brown and orange-red granules, but more characteristically as rhomboid plates arranged in a radial pattern, so-called hematoidin burrs. /he·ma·toid·in/ (he″mah-toid´in) a hematogenous pigment apparently chemically identical with bilirubin but formed in the tissues from hemoglobin, particularly under conditions of reduced oxygen tension. A pigment derived from hemoglobin that contains no iron but is closely related to or similar to bilirubin. Hematoidin is formed intracellularly, presumably within reticuloendothelial cells, but is often found extracellularly after 5-7 days in foci of previous hemorrhage. a substance apparently chemically identical with bilirubin but formed in the tissues from hemoglobin, particularly under conditions of reduced oxygen tension.